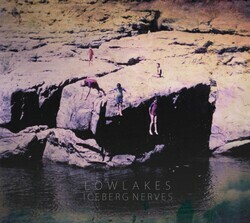 Lowlakes’ music has a sense of the cinematic. Their marriage of shoegaze, alternative,dream-pop is dark with imagery of midnight, wintry landscapes- punctuated by bone-chilling waves of frontman Tom Snowdon’s voice. From the highly acclaimed LP Iceberg Nerves ‘Replace The Face’ dips and weaves through an airy yet calming vocal arrangement, accompanied by a marquee hypnotic percussive presence. With dreamy vibes in abundance, the track ingeniously conveys an emotive push-and-pull struggle, cleverly initiated through thoughtful use of melody and soothing rhythm. Originally hailing from Alice Springs. Their marriage of shoegaze, alternative-electronic and dream-pop is dark with imagery of midnight, wintry landscapes- punctuated by bone-chilling waves of frontman Tom Snowdon’s voice. Bigblood - The most stripped back and intimate track from Lowlakes' debut LP, Bigblood is a call to introspection, showcasing the band's knack for crafting emotive and visual music, led by the distinctive vocal of Tom Snowdon. Lowlakes kind of feels like your typical Melbourne band. But invites from NY's CMJ Music Festival and shows on the US West Coast, it’s got to be more than typical. Cold Company is a kind of classy darkness, like a crime thriller wearing a lost romance hat. It’s that ambience, pitching drone guitars but with an 80s pop core that drives you to move. Buffalo is a thoughtful union of ambient, mood-setting textures, layered with shimmering guitars and gliding choral hooks. Angelic atmospherics are guided by a driving yet discreet rhythmic undertow. This carries decorative vocal licks and some tasteful trumpet through gentle structural shifts. Such an interesting mixture of synth and indie-pop and not-a-little-bit-aggressive garagey type stuff that doesn't come off sounding like anything else; except maybe like a very surly B52s. A 3 minute piece of vintage rock'n'roll nonsense plus hand claps and synth solos.There is a juvenile kind of fun that radiates from this track-sometimes that makes you desperately want to do the Twist and start calling everyone 'Daddio'. 'Spanish Flu' is immature surf-rock trash and it knows it,ah- loves it. ele is a stepfather/stepson powered musical ensemble from Melbourne. Distinctively shadowy kind of avant-garde rock-and-roll that is often rhythmically offhand and harmonically prickly, captured on an open-reel tape recorder. This song creeps up to you,like the need for a journey of endless roads, escaping everyday monotony, craving for freedom and independents,getting lost in dark ringing retro guitar riffs and the psychedelic bass line while natures scene is flying past and you feel good.